For those of you not familiar with trimming meplats, a short explanation might be in order. The meplat of a bullet is the nose where the jacket is drawn to a point. In a typical match bullet, this would be the hollow point. Anyone who has ever tried to measure the length of bullets (from base to tip) using calipers knows that this measurement varies from bullet to bullet due to manufacturing inconsistencies. That's why we prefer to measure bullets at the ogive with a tool such as the Stoney Point comparator. For the long-range marksman, meplats are very important because small inconsistencies at the bullet's tip have a direct effect on the Ballistic Coefficient (BC) of the bullet. At the longer ranges, where velocity has begun to drop off, these differences in BC show up on the target as increased vertical spread. There's no way around that--by definition, bullets with different BCs will drop at different rates. However, by trimming meplats, bullet lengths are made more uniform and meplat diameters are equalized. In turn, the bullet-to-bullet variance in BC is dramatically reduced. End result--you get a set of bullets that all behave the same in the wind. OK, getting more consistent BCs is desireable. But what is the downside of trimming meplats--how else does this affect a bullet's BC? Trimming the meplats causes the BC to be reduced approximately 2%, which translates into less than a quarter-MOA sight adjustment. In most disciplines we can live with that. Hence the interest in the meplat uniformer. 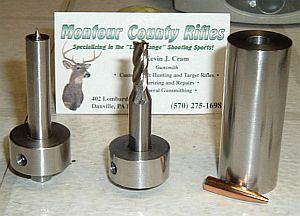 Most of the meplat-trimming tools on the market (such as the new bracket-mounted Sinclair trimmer) use a Delrin insert to hold the bullet in the tool's body. The bullet is trimmed with a hand-turned end mill, producing a flat horizontal cut on the bullet tip. Most of the uniformers use this method, with one exception, and that is the subject of this review. The Mountour County Rifles (MCR) Meplat Tool--A Better Mousetrap? Kevin Cram, of Montour County Rifles, has created a meplat uniformer with a couple unique features. First, it does not use a Delrin insert to hold the bullet. Instead Cram's brainchild features a caliber-specific seat for the bullet's ogive, precisely milled in the stainless tool body. This, Cram believes, produces better results and more consistent meplats. Cram also provides a countersink for the "finishing touch", but more on that later. The MCR uniformer is made from solid 303 stainless steel. The bullets are held by a throated bullet-diameter hole bored into the uniformer's body, then polished to eliminate any bullet damage. The hole's diameter is milled specifically for one caliber; accordingly it achieves a very precise fit. One of the drawbacks of other tools that employ a Delrin (plastic) insert is inconsistent bullet seating pressure arising from the natural "give" of plastic verses stainless steel. I must note, however, that whatever uniformer you use, be it Delrin or stainless steel, you must develop a feel for inserting the bullets, or you will notice differences in the overall finished length. Some makers of other meplat tools claim that stainless steel can engrave the bullet jacket if you use a heavy hand. They cite this risk as the reason for using plastic rather than metal. Could they be right? Well, I did try to engrave a bullet with the MCR tool. I tried using much more pressure than normal, and still could find no marks from the MCR tool. I think, aside from using a hammer, engraving is a non-issue. I presume other tool-makers use Delrin so they can make multiple inserts available for the same tool body. This is not a bad idea, by the way, if you need to uniform a wide variety of calibers. It would be quite expensive to buy an MCR tool for five or six different calibers. MCR includes a special component not found on other meplat uniformers. This is a tip-deburring accessory designed to countersink the meplat and remove any small burrs pushed into the inside of hollow points during the meplat uniforming operation. The countersink/deburrer really works. It definitely gives a more finished appearance to the tip of the hollow point. 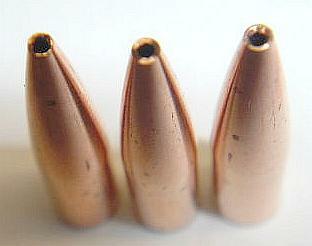 In the top-most photo of three 88-grain Berger LD bullets, the bullet on the left is right out of the box. Note the slightly jagged meplat appearance. The bullet in the center is after meplat uniforming, with a flat horizontal cut. That is the best you can do with most other tools on the market. 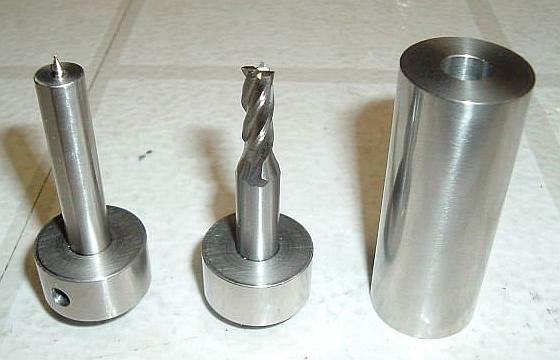 The bullet on the right has been center de-burred and countersunk using the MCR tool. Now that's a slick-looking meplat. Does the countersinking and deburrer leave the bullet with a slightly higher BC than other tools? That would be hard to prove. But you certainly end up with bullets that have a smoother tip with fewer burrs. Since its introduction in 2003, Kevin Cram has made many refininments to his meplat tool. Kevin tells us: "I originally started out with a 3/8 end mill and 3/8 shank. That worked fine, but occasionally the flutes seemed to grab and chatter inside the body. I then decided to switch to a ¼-inch cutter with a 3/8 shank. This allowed a smooth cylinder to ride on rather than the flutes. The tool's body was originally two inches long, but I soon found out that did not support the end mill well with some of the larger caliber longer bullets. I've since lengthened it to 2.5" long for all calibers. I may, in the near future, be knurling the stops and some of the body, but for now I don't see the major advantage other than adding time and cost." I received my MCR tool in 6MM caliber. Right away I noticed how beefy it was compared to the competition. The complete tool tips the scales at 13 ounces. The diameter is 1", with a 2.5" body length. With end mill and stop in place, the OAL is 3.25". Included with the tool is a set of clear and concise instructions explaining the use and care of the tool. Setup was a snap using a feeler gauge as suggested, and it is easily changed for different bullets. I uniformed four different brands of bullets, both boat tail and flat base. I set the uniformer to remove .007" of material from each of the bullets, although Kevin states that some users remove as much as .015" depending on the condition of the meplats. I settled on a system of just inserting the bullet till I began to feel resistance, then giving it a light push with my index finger to seat it home. Then, using my finger to hold the bullet in place, I began the uniforming process. With practice, I feel that one could achieve an OAL spread of LESS than .003" once you perfected the technique. If one then culls out the few that do vary and use them for foulers, you'll have a set of match bullets with very consistent BCs. I did notice that some bullets, due to the design of their ogive, seemed easier than others to uniform consistently. The Lapua 105-grain Scenar was by far the easiest to work with and attain good results. On the other hand, my beloved BIB 95-grain flatbase bullets were a bit temperamental. As noted, among the bullets I trimmed, I initially saw variances of up to .008" in overall length. After uniforming twenty-five bullets of each brand, that difference was held to no worse than .003". Following the bullet insertion technique I mentioned above helps achieve the best results. CONCLUSION--When Is It Worth Trimming? Will I trim my meplats? The answer is "yes and no." For yardages beyond 500 I'll give it a try since I'll take every edge I can get, be it real or imagined. For 300 yards and under, I doubt I'll bother, unless I prove to myself it makes a difference. The jury's still out on that one. The MCR Meplat Uniformer is a quality product. This tool definitely has some advantages, compared to the other meplat uniformers that I have tried. The countersink/deburrer really works. MCR's Kevin Cram stands behind his products 100% and will bend over backwards to make you happy. You can't ask for more than that. Copyright © 2005 AccurateShooter.com, All Rights Reserved. No reproduction without advanced permission in writing.